If you’re looking to organise a conference, you’ll no doubt be feeling overwhelmed by the task ahead. 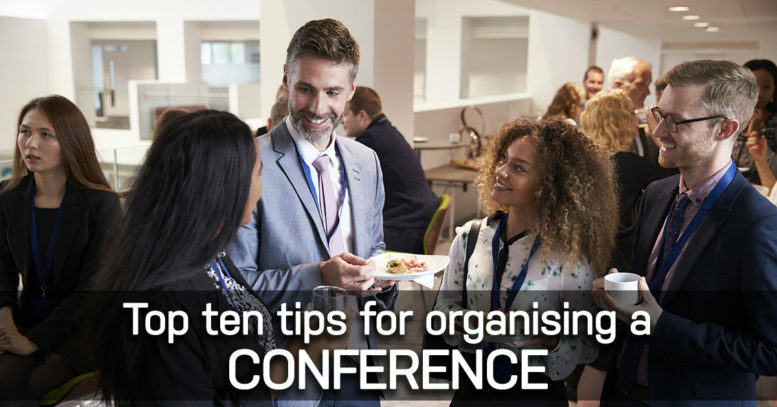 Organising your next conference is quite a large task but, if you follow these top ten tips, you’ll be able to lose some of the overwhelm and get on with the tasks! Don’t try and do it alone. Make sure you’re spreading the load, by allocating a conference organisation team. Not only will it help when allocating out the various tasks, it also eases the stress of conference organisation. Ensure you have regular team get togethers where you share progress and if needed, can catch any issues early. All great conferences have a theme. Not only does it guide the overall focus and marketing, it also gives a uniform focus for speakers and key takeaways for attendees. Do you want guests to feel inspired or encourage them to step outside their comfort zone. Organising your next conference will be easier, if you know your budget. There’s so many costs that need factoring in – from the venue to the speakers – so make sure you have a clear and realistic budget, before you get started. Once you know your theme and budget, you can decide on the date. Just make sure to give yourself plenty of time to organise your next conference. By planning well in advance, you’ll also have a higher chance of getting some great deals too. For some, the venue can make or break a conference. However, what’s most important is that you pick a venue that has everything you need. Some venues will have packages that include food and drink, whilst others may have an amazing space – it really is down to what is most important to you. It’s essential that you start selecting speakers early. Not only does it give them plenty of time to organise their speeches, it also gives you a clearer idea of the costs involved. Not all conferences require full-on catering, however most will require some form of refreshments. Obviously, the catering can have a big impact on the expenses, so don’t be afraid to haggle! Now’s the time to decide on the details of the day. What will be your key takeaway for the attendees and how can you achieve this? Are you looking to hold workshops, hands-on sessions or group lectures? Once you have the confirmed speakers and overall agenda, you can start promoting the conference. Utilise the different social media platforms, as well as online forums and websites. It’s also beneficial to encourage each of the speakers to promote the conference too. Finally, allocate your on-site team, before the start of the conference. This is where you allocate who’s going to be in charge of managing each breakout session or managing the doors. You’ll also want someone available for the speakers, as well as someone to be in charge of technology etc.